The fact that I didn't kill her is wrong. "No...! Wrong! Wrongwrongwrongwrongwrongwrong...! I don't even know her! She's just some stranger I saw walking down the street......! See! 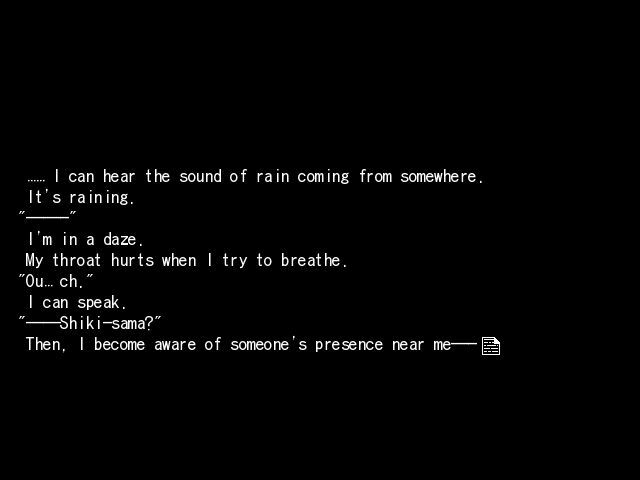 Isn't that strange to you, Shiki...!? She's a complete stranger! Why would I have to kill her...!?" There is no answer to my screams. Besides, the reason is clear. From the moment I saw her, I could only think of one thing. The contents of my stomach are coming back up.  The crimson soaks into my eyeballs. I don't think for even a moment about how I might be seen, or to hide the body. I just want to escape from here. It hurts, like my insides are burning. The tears won't stop, and my body collapses to the floor like a pile of garbage. I killed her without reason, without mercy. Like breaking apart a doll. even now, I can't find a reason. Yes, actually, I understand everything. I lusted after her. Just looking at her aroused me. When I cut her apart, it was so thrilling I almost ejaculated. 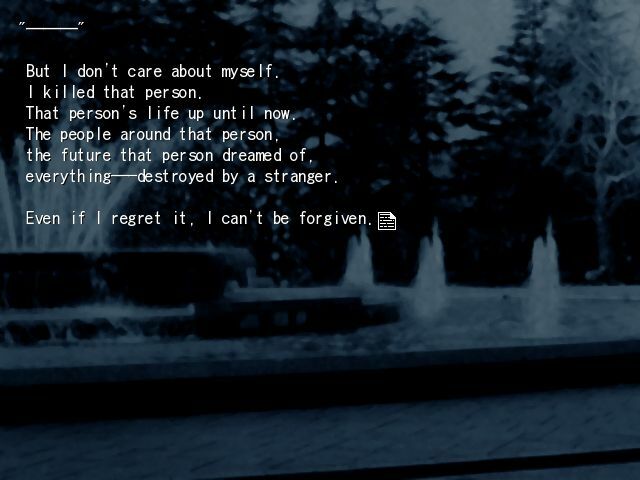 I should have understood that even a person could easily be cut apart like I just did to her. I had lived a normal life without even thinking about something like that. Then I should have put out these eyes or lived a life without seeing anyone. Even if I apologize, I can't be forgiven. There isn't even a trace of that impulse left. The thought of holding back never crossed my mind. I didn't even consider trying to stop myself. It had seemed like the obvious thing to do, and I went through with it. Then the answer is simple. I've probably been mad since eight years ago, when I miraculously came back to life from a fatal accident. "Your school called to say you left early. However, you did not come back even after dusk, so when my sister went to look for you, she found you resting in the park." "---Park?---You mean the park near here?" "Yes, when she found you, you were resting on the park bench. Then you returned to the mansion on your own feet." "...... You have got to be kidding. I don't remember any of that." "I do not believe it is such an odd thing that your memory is unstable, Shiki-sama. It is difficult for me to say this, but when my sister brought you back, you were in a daze." ...... I don't remember any of this. 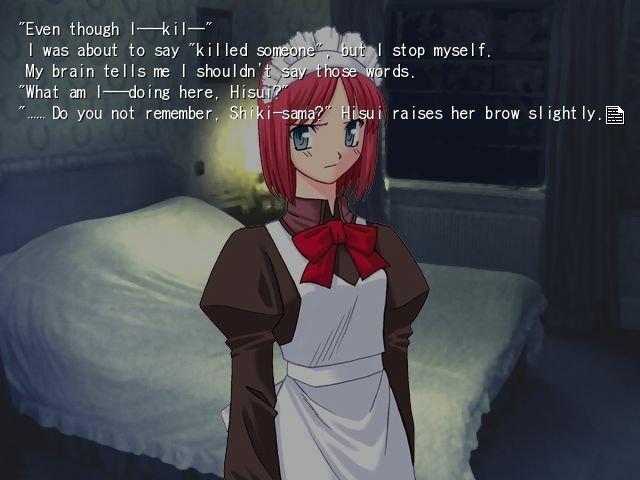 But I have no reason to doubt what Hisui says. "...... Yeah, it's already nine o'clock... I don't remember anything." "Yes. 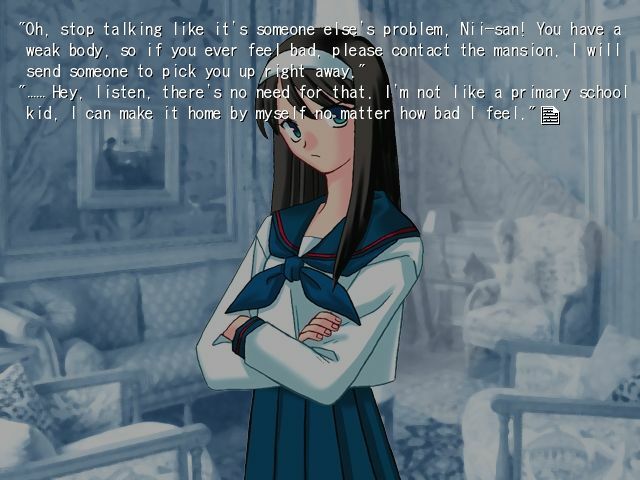 When you returned to the mansion, you said you 'wanted to sleep'. My sister suggested we call a doctor, but you said 'it happens all the time'." "---I see. I guess I do collapse from anemia all the time, but---"
...... This time, it's different. Yes... the uniform was "dirty". That's certainly one way of putting it. 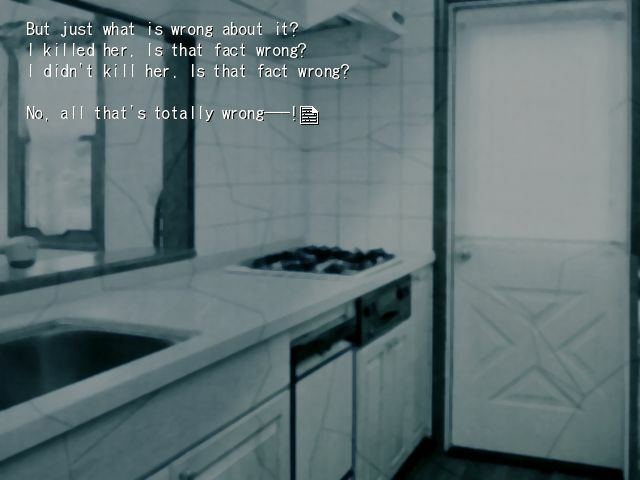 "Have you had a nightmare of some sort, Shiki-sama? 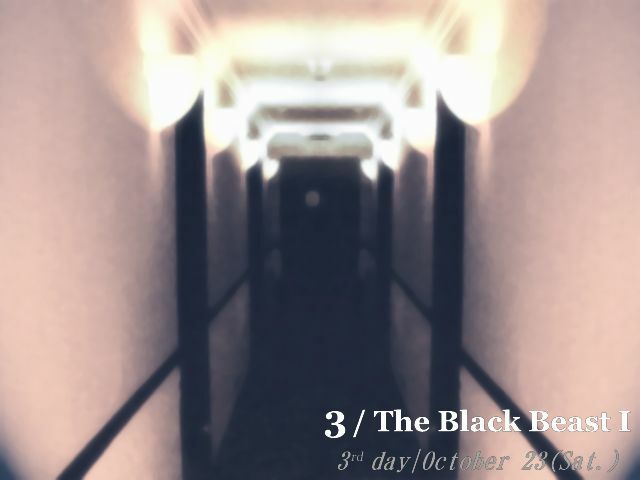 You looked like you were having a bad dream until now, and you do not look fine." 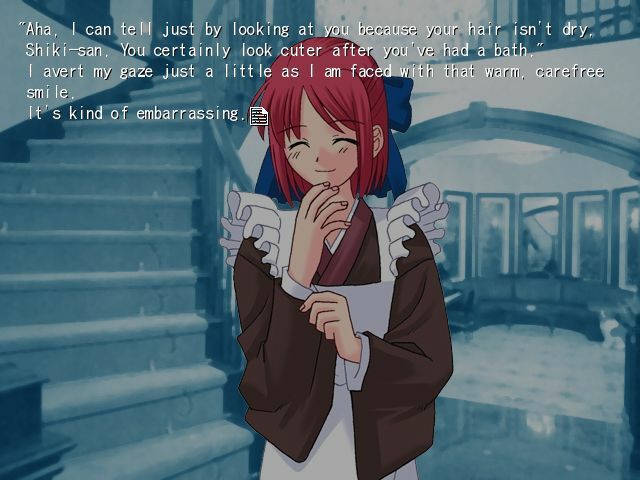 Hisui stares at my face. "A dream? 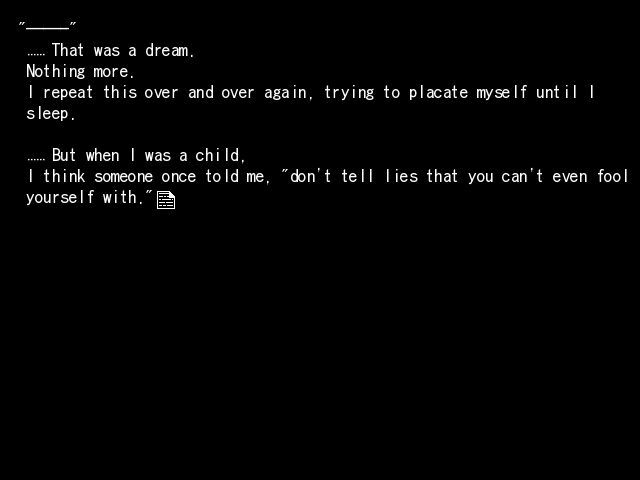 ----That, a dream?" That hideously beautiful white girl. "No---maybe you're right. That's just a bad dream." Phew. I breathe out slowly. That's got to be a bad dream. There's no way I would break my childhood promise to Sensei needlessly and for no reason. Is it being a dream too good to be true? "...... Shiki-sama? Are you still not feeling well?" "---No, I'm alright now. That---something like that must have been a dream. That's what I've got to believe." For the record, I did pick the 'this is reality' option. ---If I don't believe so, I just can't be sleeping here. "Yes. If you are feeling better, I will go prepare dinner now." ...... No way. I can't eat when the color and smell of blood still lingers in my mind.
" ---No, it's fine. I'm just going to sleep like this tonight. More importantly, Hisui..."
"Yes, what is it, Shiki-sama?" "Um... well. It seems like I came back after dusk, but did Akiha say anything?" 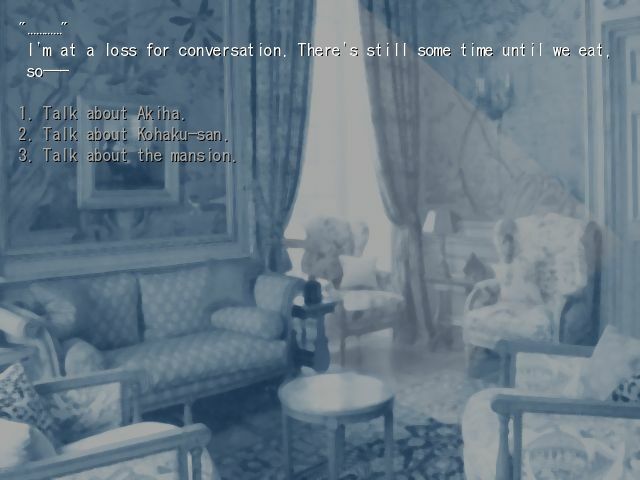 "Akiha-sama was not home yet at the time. She came back about two hours ago, and was informed of your condition through my sister." 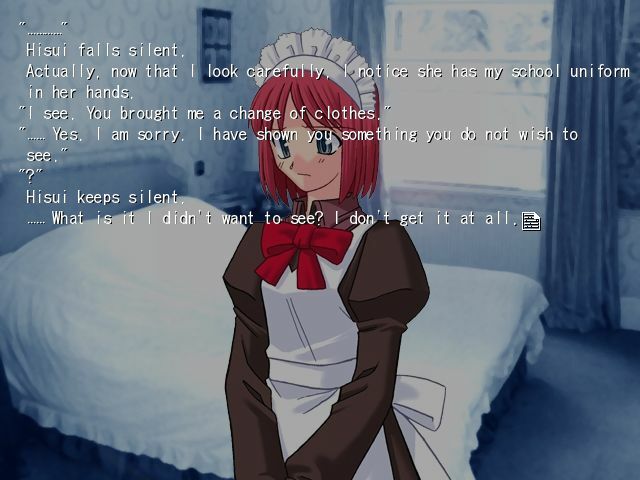 Hisui seems to silently ask, "what about it?" "Well, I will be leaving now. Please call for me if you need anything." "Yeah, thanks. ---Oh, one more thing I forgot to ask." "It's raining outside. When did it start?" "Before you came back, Shiki-sama. When my sister found you, you were drenched." I love that there's just enough doubt to really make you wonder. Could the blood have been washed away...? I see. I can't even remember that. It seems like it was a pretty serious case of anemia. ...... If that's the case, I shouldn't have pushed myself and should have just rested at school. It's like I don't even know what I felt. how do I know it was a dream? 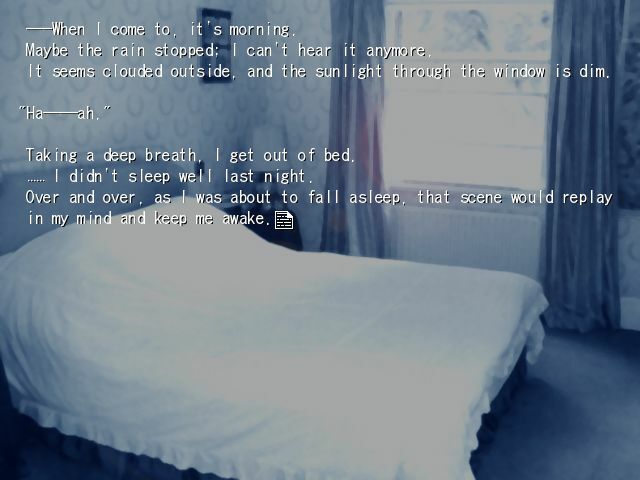 I can hear the sound of the rain outside. My mind still feels a little heavy. I glance down at my chest. ...... The old wound from eight years ago is still distinctly there, like a burn scar. On top of my desk lies the knife my father left me. 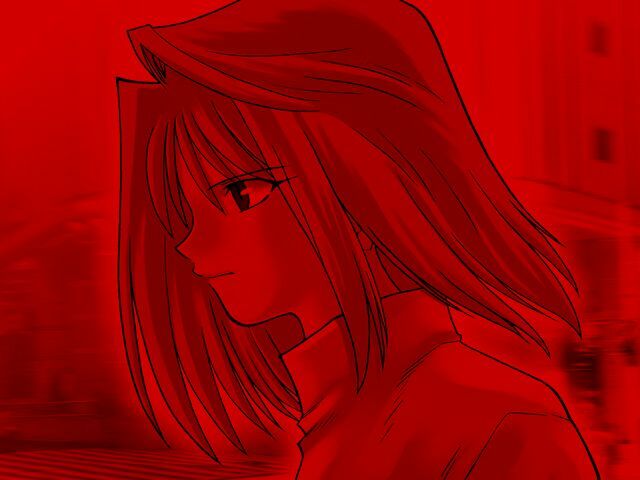 "...... A crimson floor and limbs everywhere..."
Reason and memory are liabilities at times like these. They force me to remember things I only want to forget. "It's just a dream---why am I so bothered by it?" ...... Yes. Just a dream. I should forget it quickly, without a moment's delay. It's past six o'clock in the morning. ...... Who could it be this early? Actually, I really don't get it either. "...... I don't understand, but thanks anyway. Just leave the clothes there. I'll get changed soon and go to the sitting room." "Very well, then. Please excuse me." 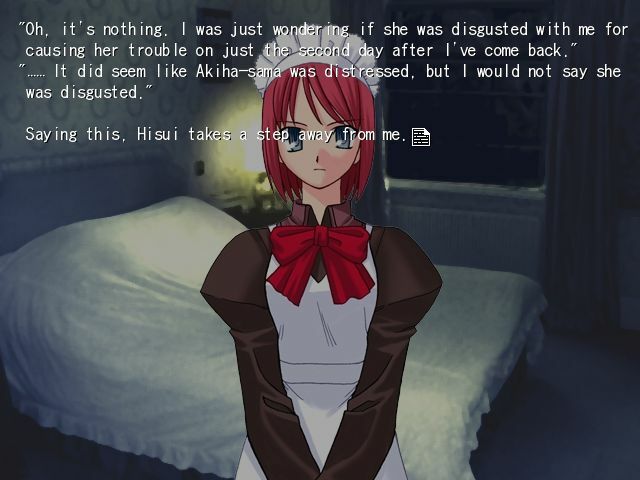 Hisui begins walking silently, only to suddenly turn around. "Shiki-sama. ...... Um... if you have the time, I will also prepare a bath for you." "...... A bath? In the morning?" "Yes. You are terribly dirty, Shiki-sama. Would it not be best for you to wash before you go to school?" Hisui asks me with her usual lack of expression in a disinterested voice. ...... Now that she mentions it, I am dirty. I did collapse from anemia in the park yesterday, after all. So, it's not unnatural.
" ---Yeah, would you mind doing that for me? I'll have time for that before I go to school if it's this early." "I understand. Please come to the bathroom in about twenty minutes." Hisui sets my uniform down and leaves the room. It's still six o'clock in the morning. With nothing to do, I spend the twenty minutes in my room staring at the ceiling. "I've really got to get it together." I clear my head with another splash of cold water and wash myself. I feel a sting as the towel touches my throat. I look at my neck in the mirror. ...... How did this happen? My throat is red and swollen. It's almost as if I injured it by repeatedly throwing up. I return to my room and change into my uniform. Astounded at how much clearer my head feels after the bath, I pick up my bag and leave the room. "Please hold on for just a minute. I'm going to prepare some breakfast now." Uh... I guess she means something to eat. The fades for a lot of effects happen so fast it can be really difficult for me to capture them, but I got two this update! Such a trivial thing causes me to remember the color of blood. I don't have much of an appetite at the moment. "Is a western-style breakfast like yesterday fine with you, Shiki-san?" "---Ah... yeah. I really don't mind... So, breakfast, huh? That bath felt so good that I almost forgot about it." "Really? 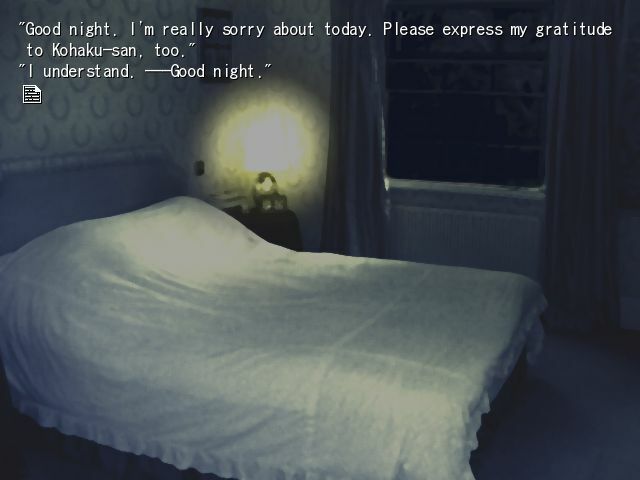 You didn't eat last night either, so I was talking to Hisui-chan about how maybe the sound of your stomach might have woken you up." "Ahaha, no. Sadly, that's not the case. I've been a light eater since I was little, so I often skip one or two meals at a time." "I see. Now that you mention it, you've got a nice body without any excess meat on you. Could it be that you're a vegetarian?" "Hmm, perhaps. Come to think of it, I get the feeling that all I ate at the Arima house were vegetables." Remember that line when Shiki grabs a hamburger later. Kohaku-san busily heads back to the sitting room. ---But I don't feel like eating right now. "What are you saying, Shiki-san!? Haven't you looked in the mirror this morning!?" "...... Ah, well, I took a look in the bathroom mirror..."
"You're lying! You wouldn't say something like that if you looked even once!" ...... Come to think of it, when I saw my face in the mirror, I think I saw death warmed over. "Ah! Please wait here, Shiki-san. I'll call you when it's ready." 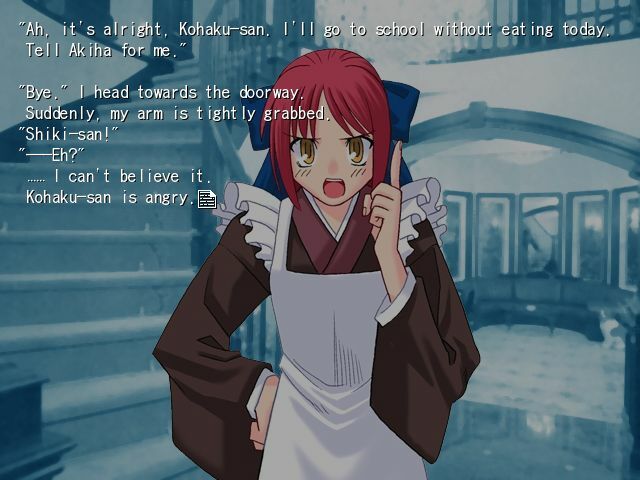 Kohaku-san disappears into the dining room by herself, leaving me, the downcast-looking Akiha, and Hisui, who stands emotionlessly by the wall. ...... This is kind of awkward. "Nii-san, about last night, is it true that you collapsed in the park?" "Seems so. 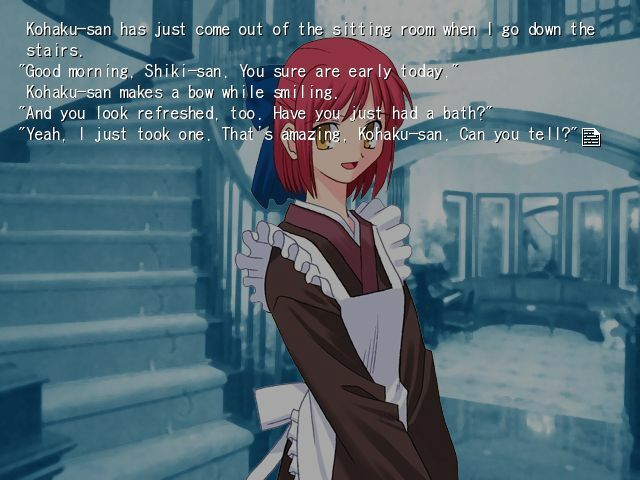 I don't really remember it myself, but if that's what Kohaku-san and Hisui say, then it must be what happened." "Yes, I would love to do that if I could." 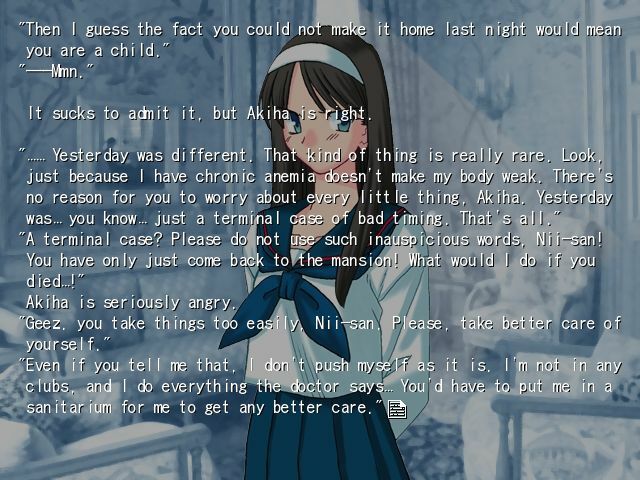 Avoiding my gaze, Akiha says something very frightening. As for Hisui, she's standing by the wall like a statue. Compared to the last decision, I think this one's pretty mundane.